Puerto Vallarta has long been known as a top vacation destination and is slowly winning hearts as an amazing place to retire or start a new life as an expat. Indeed, snowbirds have been choosing this part of Mexico for years now. Puerto Vallarta’s Old Town has gained a lot of press recently with renovations and real estate opportunities. While living in Old Town might not appeal because of the noise and large volumes of tourists, living near Old Town is a great option. Old Town (Zona Romantica) is on the southern area of El Centro, and it is one of the most popular areas in Puerto Vallarta providing that authentic Mexican small town charm that few other major vacation destinations in Mexico possess. The streets are cobblestone and the shops, bakeries, and boutiques are outstanding. You can enjoy fresh pastries daily in Old Town Puerto Vallarta. Saturday mornings is a day that you will want to go to Old Town Puerto Vallarta. They have one of the best farmers’ markets where you can purchase handmade jewelry, fresh vegetables and fruit, crafts, and even beauty supplies. How great would it be if you needed an adjustment or a massage and you can have it done with a chiropractor that is at the farmer’s market? Just around the corner from the farmer’s market is the tortilla factory and there are also taco vendors. You can enjoy delicious and fresh ceviche and aquachile that is prepared fresh for you. If exciting nightlife that comes with a hip vibe is what you are looking for, then in Old Town or El Centro and Olas Altas has lounges, clubs, and bars that will meet anyone’s taste. 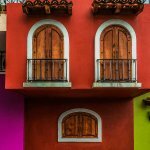 The architecture and culture in Old Town Puerto Vallarta is amazing. There may be a hidden jewel or historic property that you may encounter when you are walking through the area. If you haven’t see the local church in Old Town that is called “Nuestra Señora de Guadalupe”, and in 1965 a crown was added to the church. The church is near the Plaza de Armas and you can tour the inside of the church too. Just a few steps from Plaza de Armas and the church is the Los Arcos Amphitheater. The amphitheater is beautiful and you will not want to miss seeing it either. There is something special in Old Town Puerto Vallarta that you will not find in other Mexico cities. Old Town Puerto Vallarta has a mixture of old and new. The locals in Old Town are very friendly. During whale watching season (December through March) you can clearly see the dolphins and humpback whales from the beach. Old Town has world class dining, amazing views, and the best shopping too. You can walk along the Malecon and enjoy fresh coconut and oysters from vendors. Puerto Vallarta is intriguing. You will appreciate Old Town Puerto Vallarta once you have visited it. Old Town is not just a great place to visit, but an even better place to live. Life in Puerto Vallarta is best when you live near this area.